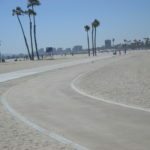 Bike Route #4- This is a bike route along the beach communities between Seal Beach and Long Beach. On this scenic adventure, we ride approximately 18 miles total. 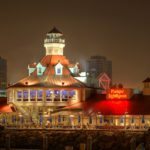 This particular tour offers: the whimsy of gliding through one beach community after another; the beauty of the Pacific Ocean, and at the far end, a commanding view of the Queen Mary docked in the Long Beach Harbor! 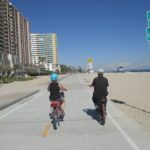 However, the real cherry on top here, is that along the beach portion of this route, the pathway for pedestrians is completely separate from the bike path. 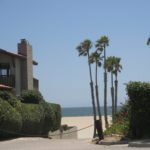 This is our incredible good-fortune, and I found myself completely spoiled with this arrangement vs. other beach communities where we are dodging those walking along the pathway. We do try our best to keep riders off most of the busy streets. 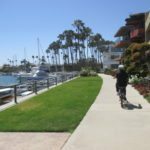 By following this handy Bike Route as your guide, you can replicate our ride and hopefully enjoy hours of fun on a Pedego electric bike. 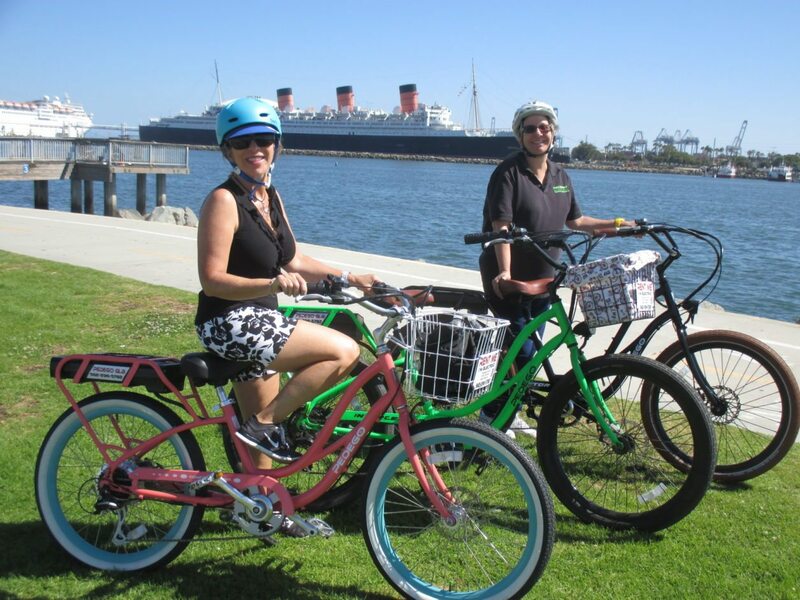 We begin this ride at the Pedego Greater Long Beach retail store (located in Seal Beach). This is one of the first original “fully-branded” Pedego-only retail stores. Owners Beth Black & Brian Ballard and their friendly staff have a bike-centric store located just blocks from the beach. 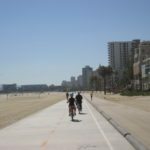 They sell all the different models of Pedego bikes, perform repairs and customizations, as well as offer accessories (installed), and rent bikes as well. They also lead very popular weekly group rides as well as personalized guided tours. 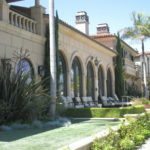 They’re creative with special offers and events each month. 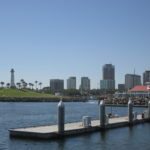 More information about Pedego Greater Long Beach can be found at the end of this article. 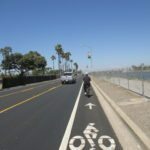 Just to give you a quick overview—- we start this route by meandering our way through the residential neighborhood of Seal Beach, Alamitos Bay, along Marina Drive in the bike lane, then let the powerful Pedego bikes prove themselves while climbing the soaring 2nd Street Bridge to Naples Island, where we ride along the charming canals. 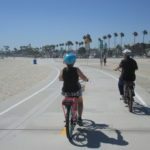 From there, it’s a quick ride to Belmont Shore where we find the entrance to the paved bike path that meanders on the sandy beach adjacent to the Pacific Ocean. 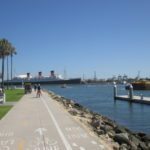 We ride this pathway all the way up to Downtown Long Beach and Shoreline Village. From here we can wave to the Queen Mary across the Queensway Bay. 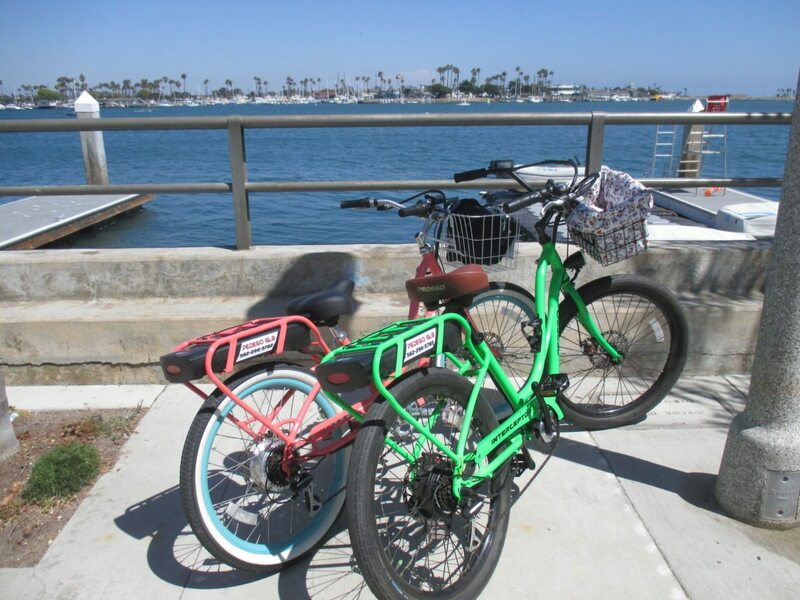 We then reverse the order and return to the Pedego Greater Long Beach retail store. We have selected this route to avoid as many of the major roadways as possible. It is just more relaxing that way! And at the end of the article readers will find a few suggestions for dining as well. -Before leaving, confirm what time you will be returning to the store, and what time the store actually closes. Get your loaner helmet and slather on some sun screen. You can also ask to borrow a bike lock, however I never let the bike out of my sight, and suggest you do the same. 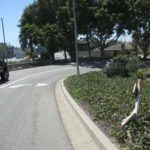 -A Quick Reminder for your Safety: Always watch for cars, and especially when you are approaching an intersection while riding on a sidewalk. They may not expect you to be riding along on the sidewalks, let alone at 8-10 mph. I also notice that they often drive right up past the cross-walk before stopping their car. This can be quite dangerous if you happen to be passing by at that exact moment. Be alert. Make eye contact. Use your bell. Don’t just assume they see you and will stop. Just sayin’! -Departing from the Pedego Greater Long Beach retail store on Coast Highway, we make a RIGHT turn. 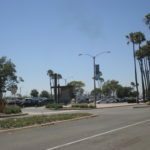 We exit the north end of the parking lot along Bolsa. 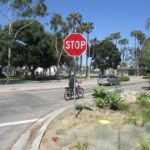 At the stop sign we make a RIGHT, and then at the first street, Silver Shores, make a LEFT. Then LEFT on Coastline. And Another LEFT on to Mar Vista. 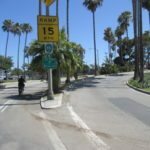 This leads riders to PCH, and on the other side of this street this becomes 5th Street. The Ocean is ahead. 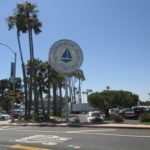 -We cross PCH and are now heading West on 5th Street. Continue all the way down to Ocean Blvd. and turn RIGHT. 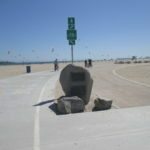 Take this all the way to the end at 1st Street and the ocean is on the left. Make a LEFT down the slope and go to the far end of the parking lot. 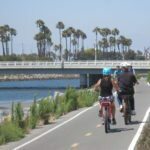 -A Juncture- This is a spot where riders will see the River’s End Café to the left, straight ahead is a monument sign with information on the Los Cerritos Wetlands, straight ahead is the Alamitos Bay, and to the right is the San Gabriel River Pathway. 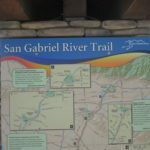 -Riders can also view the San Gabriel River Trail which offers numerous routes heading East all the way into Whittier and beyond to the local mountains 40 miles away. 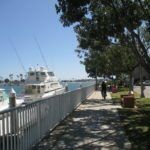 -We turn RIGHT onto the Pathway near the River’s End Cafe, and then make a LEFT onto Marina and take the bridge over the river. There is a bike path along this stretch and it is not very busy with automobile traffic. 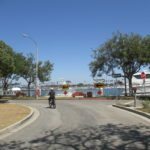 -At the next stop sign riders will see the Alamitos Bay Marina ahead. There are shops, and restaurants. 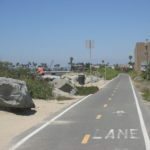 -Make a RIGHT turn at the Marina entrance and ride along the Bike Path. This is a wide street and goes for a half a mile and then curves to the left. Just follow it along. There will be more restaurants and stores on the left and right as riders glide past. -This road eventually intersects with 2nd Street. And PCH will be to the right one block (for reference). Riders will want to cross over 2nd Street at that light, and very carefully turn LEFT and go up and over the Bridge heading north. 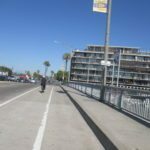 Note: Pay attention as the bike pathway on the street is narrow and riders will have two lanes of traffic just to their left. Continue straight, and be careful not to wobble to the left or right. This is a short stretch of roadway, and the views of the bay at the crest of this bridge are spectacular. -On the RIGHT side riders will see an exit to Appian Way and this will curve around to the right. 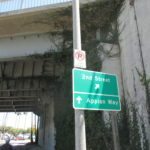 At the bottom of the off-ramp, take a RIGHT on Appian Way. Follow this roadway all the way down, past the Long Beach Yacht Club on the left, and continue to a pathway. 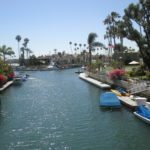 This is where Venice meets Balboa Island as riders will follow along and find themselves on a lovely bike path with water to the left and beautiful homes on the right. The street is Vista del Golfo and this meanders in a semi-circle around one half of Naples. 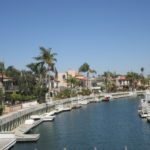 This is a charming enclave of homes with canals that carve their way between the rows of homes. -As we do so, we look for a street named Ravenna (one of the four or five that intersect there, and exit stage RIGHT. We head up Ravenna and this meets back up with 2nd Street! -We cross the street and eventually make a LEFT turn heading north on Appian Way near Mothers Beach. We go over a small bridge and make a slight LEFT at Bay Shore. There is a three-way stop at this T-intersection. -Along Bay Shore is a lovely stretch. After a few blocks, we cross busy 2nd Street with a light. This roundabout route protects us from having to merge into that traffic to reach this intersection. During summer, there is a barricade on the far side, since it is closed to automobile traffic (except for the patrol cars we observed so watch for those every now and again). 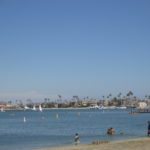 -To the right are beautiful homes, and to the left is the Alamitos Bay Beach. In summer there are throngs of children playing, and every imaginable beach toy is in motion. There are paddle boarders and it is just a hub of activity. As we continue along westward, we can see hints of the Pacific Ocean in the distance. -Down the street we jog slightly LEFT to 54th Place still heading west. 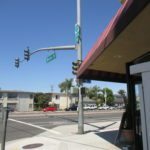 At the end of the block, we come to a three-way stop at a T-intersection on Ocean Blvd. The beach is straight ahead. As we approach the sand, we can see two alternatives for pathways. This is one of the most INCREDIBLE aspects to this Bike Route #4! There is not one, but two different pathways built all along this stretch from here all the way up to Long Beach! There is one for bicycles and a separate one for pedestrians. This is huge for those of us who tire quickly of dodging walkers who are not aware of what is going on around them. 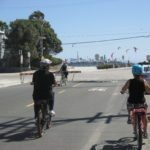 Note: Pedestrians do cross the bike path to get to the beach. Make no mistake about that, so be watchful. However it makes the ride for those on a bicycle so much more enjoyable. 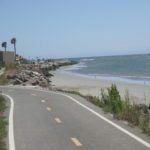 -We travel along this pathway for a pleasant 8 miles or so. It is a lovely stretch with the ocean to our left, and cliffs to our right. The above cliffs carve the well-known trek along Ocean Blvd. which leads directly to downtown Long Beach. 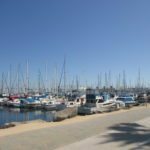 -We travel along and are pleasantly surprised to see a ginormous Shoreline Marina filled with boats bobbing in the water. There is a greenbelt and all along the pathway is dotted with restrooms. 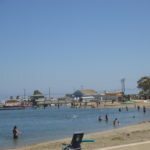 -At the far end of our journey, we enter Shoreline Village and as the road curves to the left we see the main Queensway Bay. 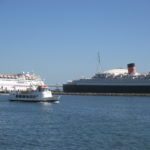 The Queen Mary is a statuesque icon there in the Bay and to the left there always seems to be a cruise-liner coming or going. In the distance northward, is the Long Beach Harbor. 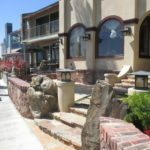 -Just next to the parking lot is a very large restaurant with an outside patio. 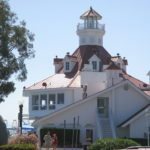 This is called Parkers’ Lighthouse Restaurant, housed in a lovely seaside-themed building with a bright orange gabled roof. If the weather is nice riders can enjoy sitting out on the patio (and keeping an eye on their bikes close by). 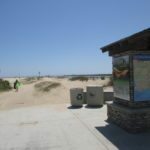 -As we head back to the store to return our bikes, we reverse our travels and find our way back to Seal Beach! 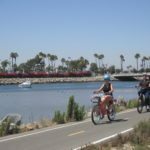 -For those riders who would prefer not to meander back through the Naples Canals, riders can remain on 2nd Street and then turn RIGHT on Marina (just before PCH) which takes riders back through Alamitos Bay in a more direct route. Historically the floodplain is estimates to have supported at least 47,000 acres of wetlands, dating back to the 1870s. Studies estimate that development has eliminated 86% of those wetlands including the vast alkali meadows and seasonal floodplain wetlands. 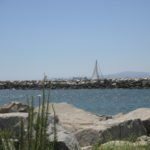 Where the San Gabriel River meets the Pacific Ocean a special wetland occurs, a tidally influenced salt marsh. The Los Cerritos Wetlands is the salt marsh between the San Gabriel River and the Pacific Ocean. It is a thriving area of habitat. The side Blotched Lizard, Coyotes, and the Western Harvest Mouse are found in these areas, along with the Striped Shore Crab and Wandering Skipper. Bird species include: Cinnamon Teal, Killdeer, California Brown Pelican, Great Blue Heron, Osprey, Canadian Goose, Double-Crested Cormorant, Black Phoebe, Great Egret, Snowy Egret, Belding’s Savannah Sparrow and Least Tern. 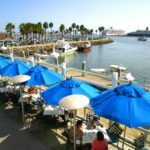 Famous for their Mesquite-grilled seafood, sushi, steaks & a robust wine list, plus harbor views & live music. Set inside a historic schoolhouse, this all-day American cafe serves a made-from-scratch menu. The restaurant is charming with an outdoor patio as well. Between the parking lot and sandy beach. During the summer months they are open M-W 7:00am- 2:45pm and Thursday thru Sunday from 7:00am to 9:00pm. They do have an outdoor patio. Pedego Greater Long Beach has a great selection of bikes for sale. They customize bikes and perform all kinds of repairs, add accessories and upgrades too. They sell bike locks, helmets, racks, phone holders, doggie carriers, and so forth. They also rent bikes for $14.00 per hour, or $50.00 per day. 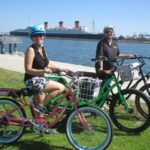 Beth and Brian, who were recently featured in a national Time Warner Cable commercial, are the co-owners of Pedego Greater Long Beach, and they prides themselves on offering so much more than just a “store”. 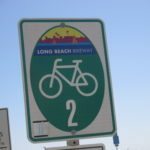 They want it to be known as the hub— a center for the Greater Long Beach electric biking community. The Silver Spin presented by Pedego GLB in partnership with Caremore Health Plan offers seniors (and friends) a free social event and guided tour. Meet at Pedego GLB at 10:00 and enjoy a light breakfast hosted by Caremore. Then, climb on a Pedego electric bike and join us for a free two-hour guided tour. Each week, the destination is different. But the fresh sea air and sunshine mixed with camaraderie of fellow riders, makes for an exhilarating experience. 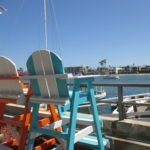 Twice a month, owner Beth Black leads a group ride that departs the store at 10:30 for a fun guided 2-hour tour of the area. Each ride includes a stop at a local restaurant for a no-host (though usually discounted) lunch. This is a sociable group, so expect to have fun meeting and laughing with new friends. Pedego owners who purchased their bikes at Pedego GLB ride along for free (except lunch). 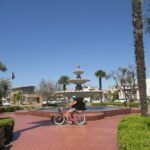 Those who purchased their Pedego bikes elsewhere pay a nominal $5 fee to join in and those who don’t own Pedego bikes can rent them at the shop to participate in the event. Call the store for more information. I have a link for specs and particulars below, but as a lady who just likes to “keep it simple”—- here is how I have simplified the many options and styles. Style-wise, there is the Comfort Cruiser a Step Thru (with a lower bar in the middle). We used to call that a “girl’s bike” but the benefit has now expanded to those with limited mobility, the Interceptor (both step thru and with bar), City Commuters, and Trail Trackers with the wider, super-fat tires.